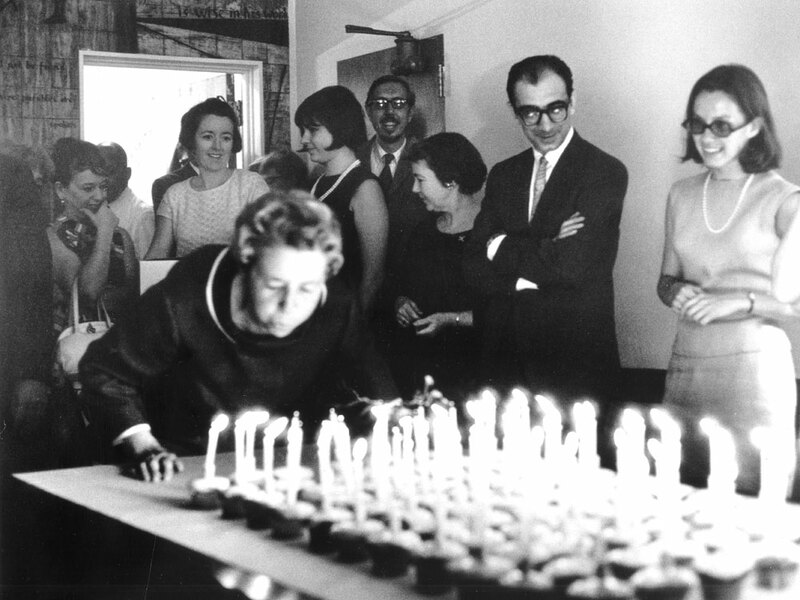 Webb celebrates her 75th birthday in 1967 with serried ranks of cupcakes. "A good life is found only where the creative spirit abounds, where people are free to experiment and create new ideas within themselves," - Aileen Osborn Webb (1892-1979), founder and patron of the American Craft Council. Paul J. Smith, Director Emeritus of the American Craft Museum, who worked closely with Mrs. Webb, as she was universally known, for some 20 years, remembers this determined yet modest woman whose vision, enterprise and humanist spirit helped propel and nurture a global movement. Tell us your earliest memory of Mrs. Webb. In September 1957 I moved to New York City to accept an exciting position at the ACC, developing traveling exhibitions and educational elements. At the time, the museum was 1 year old, and the total ACC staff was housed in a renovated brownstone at 29 West 53rd Street, which David Campbell, then the council president as well as an architect, had beautifully designed. I vividly remember meeting her in the conference room next to her small office, where we had a cordial exchange. I was 26; she was in her mid-60s. My first impression was of a tall, elegant woman, dressed in conservative clothing. Her personality reflected her privileged upbringing, but she was down-to-earth and had a warm, outgoing attitude. I think, as it was a new acquaintance, and I was very young, she probably wondered where Dave found me. In memos she often referred to me as "young Paul Smith." Her background was so extraordinary. Yes. Born into wealth and privilege, she was brought up in a much-respected Hudson River family, attended the best private schools in New York and Paris. At the age of 20 she married Vanderbilt Webb, which brought her into association with another famous family. While she was an accepted part of the elite social structure of that time, she was also cultivated to contribute to society. I think that was characteristic of that generation of people born into wealth, including Eleanor Roosevelt, who was a friend of Mrs. Webb. After raising four children, she became involved in the 1920s with the local Democratic Party and served as vice chairman. I have read that at an event she organized, Mrs. Roosevelt gave her first political speech. Mrs. Webb later also became very involved with the New York Junior League. Her involvement with craft activity began in the 1930s, during the Depression. The New Deal and its programs probably had something to do with it, as she was a friend of the Roosevelts. But it was also an instinct on her part to try to help people in some way. So she began to develop a marketing program that led into Putnam County Products, to help sell local produce and home crafts. As I understand it, it began as an interest in helping people during the Depression to sell and make a living. She could see people were out of work; they didn't have any money. And so Putnam County Products was selling anything that was salable. It was farm produce but also quilting, handmade clothes, or whatever was termed home craft. What's important to understand is that it was a cause based more on helping people than on the product. But it did nurture her interest in crafts, as she was very cultivated in the arts. One can sense that her involvement led her to look at other activities that were taking place. She became aware of programs on the East Coast, like the League of New Hampshire Craftsmen, the Southern Highland Craft Guild - groups that were doing similar things and were founded during the Depression as well, again with the effort to help market handmade work. So Mrs. Webb, being a very driven organization person and very visionary, began to make connections with other groups and assemble gatherings. It escalated to the point where she became more and more involved, and it evolved into her various activities and the programs that resulted. The expansion of her marketing program and the establishment of America House in 1940. The founding of Craft Horizons magazine, which began as a mimeographed newsletter in 1941. The formation of a national organization, the American Craftsmen's Educational Council, as ACC was then called, in 1943. The establishment of the School for American Craftsmen in 1944. The founding in New York of the Museum of Contemporary Crafts in 1956, later renamed the American Craft Museum and now known as the Museum of Arts and Design. The formation of the World Crafts Council in 1964, and many other special projects, conferences, and exhibitions, including the important "Young Americans" competitions. She depended on staff and the guidance of ACC trustees to develop these ideas, but she was central to the vision. I think of her as a visionary. Her aim was to do something with a focus and explore ways to expand it. She never looked back, and was always interested in what could be done next to improve what she was involved with. It was just a positive energy that she brought to looking at the craft field with a broad perspective. All of the programs she initiated had a profound effect. So it was an ongoing vision: How can we expand and improve upon this activity? It was a promotional effort that was so important, because if she hadn't motivated all that, I don't think a lot of what exists today would be around. What were your own early years at ACC like? It was a very active period, with national conferences and many things going on. I was a doing a bit of everything and I soon became David Campbell's assistant. David took on the directorship of the Museum of Contemporary Crafts in 1960, became involved with the museum, and eventually was named assistant director. When he died suddenly in 1963 and the director's position was open, I think Mrs. Webb was instrumental in my being given that important position, which was wonderful to have and quite challenging at the time. You've said Mrs. Webb would come into the office every day. Yes, her work ethic was very important. This was totally a volunteer effort on her part. She would be there every day in her office, and was involved with everything. She of course would take vacations or trips; but even in her later years, after she broke her hip, she would still come in every day if she could arrange it. There were many occasions when it was amazing, the kind of energy and commitment she had for that long period of time. We didn't always agree on everything, but she was really supportive of people who were helping her to realize her dreams. She would comment negatively about something, or not like something, but she never stopped you from doing anything. How would you describe her aesthetic and taste? I think of her aesthetic focus as an appreciation of beauty. People of her milieu were often more comfortable with things of the past than of the present. Yet she was very much in tune with what was happening, and connected to new directions. Her living environments reflected beauty. When, in the late 1950s, she acquired her penthouse residence that combined two apartments designed by David Campbell on East 72nd Street, it resulted in a modernist environment, with white marble floors and a big wall of glass looking south - very beautiful, very modern, very contemporary. There was an interesting mixture of art and furnishings. In the living room she had a spectacular Monet on a deep purple wall and she commissioned George Wells to create a large hooked oval rug, drawing upon the soft pastel colors in that painting. For the other end she commissioned Paul Aschenbach to make a dining table and some very uncomfortable dining chairs that I sat in many times. She wasn't a collector as such, but she enjoyed possessing and living with handmade works. For the front entrance hall she acquired one of the early innovative weavings by Lenore Tawney, who was beginning her avant-garde direction. There were many other handmade objects, and fresh flowers and plants from her country garden and greenhouse. In her penthouse she had a studio equipped to create ceramics, where she would make works that she often gave as holiday presents; I have several pieces that she gave me. Mrs. Webb didn't just appreciate art. She also wrote poetry, and did other hands-on activities - woodcarving, painting. She also had a residence at her home in Garrison, New York, where she would go on weekends. Her marriage to Vanderbilt Webb gave her a connection to the Webb estate in Shelburne, Vermont, and there she built a small "glass house," as it was called, on Lake Champlain, where she would often go in the summers. In all these places, she commissioned or acquired work for the environment. The Garrison house was a little more traditional in format, but I recall she acquired a Wendell Castle table and various other works that she appreciated. It sounds as though she had an extraordinary combination of qualities: a desire to do good, an artistic sensibility, and the forcefulness to realize her vision. Yes. It was a combination of all that, and I think you have to credit her family heritage. The Osborn family was very involved with the arts and patronage. Her father collected impressionist paintings, many of which were donated to the Metropolitan Museum. So she was brought up with cultural exposure. She went to a finishing school in Paris when she was young, where she learned French and had exposure to the arts in that great city. Combine that with the attitude she grew up with - you know, money is not the problem, you don't have to take a job, but you do have a responsibility to do something with your life and make a contribution in some way. I think that was just inbred in her, and reflected in her whole life. And these weren't things she was doing without passion. She was finding associations or projects that really interested her. The Democratic Party was important to her, the Junior League was important to her. When she got involved with the crafts field, she enjoyed it and was comfortable with it. She saw a vacuum, an area not being given attention. And she really enjoyed the company of artists. She could have gone to luncheons every day, benefits every night, and been part of the New York social world [as did many other women of her station at that time]. She did do some of those things, but that was not her interest. She was much happier being involved with the many projects that she initiated and helped realize. I think that is a defining characteristic of her legacy, this humanistic appreciation for the arts and the handmade. Her passion for promoting this was very real, not a superficial something to do. How did she get along with craftsmen? As I've said, from our first meeting I found her to be very down-to-earth. She had a wonderful relationship with professional craftspeople. There was great mutual respect between her and Peter Voulkos, Lenore Tawney, and many other pioneers of the day. She often invited me to dinner parties she would host when visiting artists were in town. What were her dinners like? She had a live-in cook and housekeeper. A proper setting with finger bowls and all the accessories for dining. A glass of sherry or wine was acceptable; too much was unacceptable. There was a certain amount of conservatism in all these areas. There were always fresh flowers in some handmade vase on the table or around the apartment. When we would have board meetings, she would put up the craftsman-trustees. She had several guest rooms and they would stay there, and board and committee meetings would be held in the apartment. One problem was that in the winter, before Thermo-Pan glass, this 40-foot wall of glass facing south generated a lot of cold. Even the trustees complained about the rooms being really, really cold. So sometimes there was that little problem. But it was very nice that her home life and her work were not separate. She combined them. She lived comfortably, but was in the office every day and used her various places for gatherings. When the First World Congress of Craftsmen was held in New York City in 1964, the total convention was bused up for a picnic in Garrison. There were many meetings held up in Vermont at the Webb estate. So she was, I would say, very hospitable. And her relationship with artists I think was basically very good. She also traveled a lot, both nationally and internationally. And had the manners and grace to be comfortable anywhere. Yes. She could have lived in many different worlds. There was, in that era, a very elite social network in New York that she was an accepted part of. She knew Nelson Rockefeller, all the members of society at that time. But you never saw much connection with that, except when she would buy benefit tickets for everybody else's cause, in the hope that when we had a benefit for the Council and museum, they would buy her tickets. She was not one to go out a lot to restaurants, but several times she did invite me to a theater benefit. She was always generous in expressing her appreciation to the staff for their help and work. On many occasions, if she thought I was working too hard, she would invite me to the country for a weekend; I was up at the Webb estate in Shelburne several times. Obviously she was passionate about craft, but were there things that troubled her? Oh, yes. In the 1960s, when a lot of avant-garde work was being developed - such as funk ceramics, in which social statements became important - we did an exhibition reporting on those activities. And I do recall Mrs. Webb being extremely upset with some of the work in the exhibition. Really upset. She just thought this was not good, and it bothered her enormously, because some of it had sexual associations or kind of radical statements that she just found repulsive. She always had a side of acceptance that went beyond traditional work. She was open. Only when it went over the boundaries into something she couldn't understand did it upset her. That was more the issue, rather than the work itself. But what was amazing about her was she never insisted I take work out of an exhibition. Even if she really didn't like it, and really was upset, and it was her money and support that was making the exhibition possible. Still, that must have been challenging for you. Well, my reply to her was "Mrs. Webb, this is what's happening. I'm reporting on what's going on." There were times when she didn't like what was going on. We did a lot of participatory activities, with street closings and happenings and events, and things that went far from the parameters of what was considered the craft media, especially in the '60s. And she went along with all that. I remember when we did the "Cookies and Breads: The Baker's Art" show, which was a very unusual subject, I think at the beginning she wondered what that would be all about; she was always curious. But because it was a success, it brought in a whole new audience, a lot of young people, generated a lot of attention. That helped break the barriers to my doing other events. In the '60s there was so much revolt against tradition, so much break from tradition - the grassroots activity, the communal living, the drug culture, new music. It was a challenging period, and I was there creating exhibitions reflecting on some of this. She, I know, at times wondered, what is coming next? But she was very supportive. Amazing. What was the nature of her patronage? There's no accurate accounting of her vast financial contribution. I know she often helped individuals with grants that nobody ever knew about except those individuals. Her purchase and renovation of two buildings on West 53rd Street led to their eventual donation to the Council, and later resulted in a large endowment from the sale of the 44 West 53rd condo. I expect that if one could estimate her financial contribution over the years in today's dollars, it might well be greater than any individual has given to any current craft project. She just sponsored so much and paid for many year-end deficits and special projects of the Council. When the World Crafts Council, which she also sponsored, was in desperate need of money at one point, she sold her Gauguin painting for its benefit. She was truly a patron. But with all her generous financial donations, she was also very modest. And while she received many honors and awards over the years, she really frowned upon her name being credited for patronage in any public way. For example, at one point we talked about putting her name on the museum. Well, she would not allow it. She just didn't want her name anyplace, and I think that is really outstanding in today's environment, where most people who make donations want large recognition for them. That's not true of everyone, of course. But in terms of all her actual financial contributions and real day-to-day work over many years, Mrs. Webb was quite remarkable. She certainly deserves credit for her exceptional patronage, because a lot of people give money but they don't do the work. She did both. What memorable events with Mrs. Webb stand out in your mind? There were so many: museum openings, conference gatherings, social events, trustee meetings, weekend visits in the country and up in Vermont. Once when I was at Shelburne Farms, she gave me a tour of the over 100-room main house, which was a grand structure but very run-down by then, with nothing in it. And I remember her talking about how the house was when she was courting her husband-to-be. She said she would arrive for a visit with three aides, and she made the comment, "Well, you know, help was cheap then." [Laughs.] Here was this empty dining room, and she was describing what it was like with all the furnishings and the servants and the whole environment of that time and place. What's interesting is that the house and all of Shelburne Farms have, through the descendants of the Webb family, been renovated with the help of the National Trust for Historic Preservation and the National Park Service. The house is now an inn, and Shelburne Farms conducts many educational programs for the public. Adjoining it is the Shelburne Museum, which Mrs. Webb's sister-in-law Electra Webb founded. One important and challenging event was the First World Congress of Craftsmen and the founding of the World Crafts Council in 1964. Here again was Mrs. Webb's vision: having accomplished so much in developing a national program, she felt, well, there's a lot of activity all over the world, and wouldn't it be great if we could begin to connect and do something as an organization, to cultivate an approach of people-to-people with a common interest. She knew there were great craft traditions in India and Mexico and many of the Third World countries at the time, but also a lot of new work taking place in Europe and Japan. Yes, she had this vision. There have recently been some written references to her efforts being aimed at developing world peace, which is misleading in terms of what she did. It wasn't about world peace. It was really about, again, her interest in people. She felt that bringing together people interested in the crafts - from India, Mexico, England - would serve a very important purpose. She thought there was a lot in common. Underlying all of that was that it also helps to make a better world. I stress that, because that kind of people-to-people thing she was seeing - that we are one world, which today of course is a much more common view - was very visionary at that point. And her bringing people together and realizing this first world crafts congress - I don't have the statistics in front of me, but there were over 40 countries represented. It was a very large delegation with over 900 attendees, 250 of them from six foreign countries, and a lot of them had their way paid for them by Mrs. Webb, by the way. Being there and involved in that event was a very memorable experience. Once the WCC was formed, there was a series of gatherings around the world, and I attended all of them. In 1968 there was one in Peru, at Huampani, which was a government conference site outside of Lima. And of course it was exciting to go to Peru, where I had never been before. There was a large attendance, with charter flights from New York for Americans. But upon arrival, Mrs. Webb came up to me and said, "We've sent out a letter to all the delegates to bring some work for an exhibition, and can you help set it up?" And she said, "There's a designated room here" - which was an empty room! So here was where the challenge came in, as I had to instantly figure out how it was going to happen. I was able to get some volunteer architectural students, and [textile artist] Olga Amaral and her husband, Jim, volunteered time. We borrowed some props from a lumber company - cinder blocks and plywood planks to make some stands and tables - and then I had to receive all this material. Some people came with airport kitsch art, others with precious jewelry and things of value. We had to diplomatically refuse some of it. We worked around the clock to try to set it up over a couple of days. Near the end, I suddenly looked outside the window and saw this honor guard lined up. And then here comes Mrs. Webb with the president of Peru! [Laughs.] It was just mind-boggling. It was one of those things, where there were surprises and challenges, and you had to deal with it. This was the case not just with me, but with all staff. She would have some idea and suddenly launch it, and fortunately there would be people to help realize it. It sounds as though she had a way of getting the best from people. Yes, she did. And coming back to her work ethic, I do remember that she had what was called a Dictaphone in those days, next to her bed. So when she'd wake up in the middle of the night with an idea, she would dictate a memo. I have many memos from her that could well have been dictated in the middle of the night, with some idea of how to do or improve something, or whatever. And they weren't just to me, but to everybody she was involved with. What I'm portraying here is that she functioned on many different levels. This was not somebody just holding a trustee meeting or dealing with policy. She really had hands-on involvement in many ways. The first issue of the magazine was this mimeographed newsletter that she wrote. And was she was very involved with America House, I know, in selecting work. She didn't do every part of it, but certainly it was much beyond just the idea. There was involvement, always. She dreamt big and knew how to get things done. Yes, but you do have to credit the support staff. That was really important, because all this would never have happened without a lot of people - Rose Slivka, Lois Moran. And David Campbell, who was so important, really important. David doesn't get enough credit for all that he did in helping to anchor the program, especially the museum, into a real professional operation. He's the one who hired me, and on every occasion I can, I give him credit, because he had, from his experience and involvement in the League of New Hampshire Craftsmen, a real understanding of what was needed. And he created a balance with Mrs. Webb and her ideas. I think he grounded a lot of them into something that was realistic. So they were a good team. Yes. There were times when they had enormous disagreements. I witnessed that, where he was really frustrated. But the fact was, that team was so central. Here was a case where, had there been a Mrs. Webb without a David Campbell, the museum wouldn't have been what it was born to be, in terms of both the architectural environment and even the programming. I want to just be clear that Mrs. Webb was a visionary, she was involved with things, but there also was a support structure that was helping to realize all these events. Even with the World Crafts Council and the first Congress of Craftsmen, we were very involved as a staff with the program. We sat around and talked about participants and things they could be doing, and I did a special exhibition at the museum, and there was a photo exhibition at the World's Fair. It was a family effort, is what I'm trying to convey here. These times you describe sound so exciting and vibrant, with so much happening. As I look back now - and I'm dealing a lot with reflections on history as people are interviewing me - what I try to convey is the fact that in the 1950s and '60s there was a dynamic amount of activity that took place that really broke from tradition. All of the activities the Council initiated in that period - the opening of the museum, the first conference at Asilomar in '57, the founding of WCC - and all of the cultural change in America during that '60s decade, was mind-boggling. To be in the center of New York, which was the center of the art explosion as well, was memorable and dynamic. When I think back, it's hard to describe all the different activities that were taking place at the same time, in such a short time. Yes, and I don't feel that the craft field has been documented as much as it eventually will be in terms of the cultural change in America, because that was very significant, especially the back-to-the-earth movement. And there were many levels to the craft experience. What ACC was doing was trying to promote awareness of accomplished work and raise standards by showing and writing about the best work in the magazine. But you also had what is now called the DIY movement, then called "back to the earth," with the tie-dyed T-shirts and embroidered jeans and all of that. You had the Peace Corps program under Kennedy, with people traveling throughout the world, getting interested in the traditional crafts of India or Thailand, getting involved with cooperatives. All of that was kind of a catalyst for what has evolved today. It was just an amazing period of change that I think was a turning point in America. In terms of the studio craft movement, what the American Craft Council did at that point in terms of leadership was so significant, so important, in bringing people together. It was a promotional effort to make people aware of what was going on. Are people today sufficiently aware of how important Mrs. Webb was? Those who knew Mrs. Webb, or were affected by her in some way, do realize it. But I think there is a generation that never heard of her, partly because of this modesty of hers I was speaking about earlier. All the more reason why this coverage is important, to bring back attention to what she really did in terms of the Council. My feeling is that the 20th century studio craft movement was so dynamic, and now is being increasingly recognized by art history scholars. For example, two years ago Brandon Hintze, a Corcoran/Smithsonian graduate student, did a thesis on Mrs. Webb. When he came to interview me I said, "Why are you interested in Mrs. Webb?' And he replied, "Well, I found her such a fascinating person, so remarkable, I really wanted to write a thesis on her." I have the document; it's a very extensive study. He went to the Shelburne Museum and became acquainted with the Webb estate, went through all the archives, talked to the family. It's quite complete. The point I'm making is that I'm finding that the new generation of decorative arts historians have a real interest in this period, and are doing more and more. But coming back to Mrs. Webb, I think that her visionary work and her accomplishments were pivotal. And I do not think the vast network of activity today would exist if it had not been for her pioneering efforts, beginning back in the 1930s. I really do feel that strongly, and I do say that every time I can. There were regional activities like the League of New Hampshire Craftsmen, there were fine schools like Cranbrook and Alfred University, and museums like the Everson with its Ceramic Nationals and the Cleveland Museum with its May Show. But there wasn't any encompassing structure to bring all this activity together. It really was the ACC and all of its components that realized and drew attention to the craft movement. ACC's marketing program expanded from humble beginnings at the first craft fair in Stowe, Vermont, in 1966, into the big market at Baltimore I attended this past February, with 700 people showing, and the Council's other shows around the country. The museum, in its new home with a different name [Museum of Arts and Design], remains in New York. But there is a whole network of craft museums now. Even the fine arts museums in Houston and Boston are taking collections and giving attention to craft. There's a network of organizations, all the media groups - SNAG, GAS, NCECA - that are doing an outstanding job. And there is a lot of small, personal activity in every part of this country. But also, today it's very global. That's important. The World Crafts Council still exists, and has to be credited for what it did back in those early days of bringing people together. The British, Australian and Canadian crafts councils were all formed to be part of the World Crafts Council, and all are very active today. She was a catalyst for so much. Yes. I don't want to distort and say that without Mrs. Webb nothing would have happened, because there have been and will always be people who have an interest in making things, whether it's a ceramist or a blacksmith or whatever. That is always evolving and changing. And we have a Native American tradition, an African-American tradition, and many other areas, all of which have thrived and continue to thrive. What I'm trying to convey is that I feel Mrs. Webb and the ACC have to be credited for a significant contribution. Yes. It was many-faceted. Sometimes it was one-to-one, other times large networking. You know, when the Today Show would do a report on an exhibition - I was on several times - and you reach several million people in a few minutes. Even [the landmark craft survey exhibition] "Objects USA" in 1969, a project conceived and initiated by Lee Nordness, on which I worked as consulting curator. The process of assembling that large collection of 307 objects purchased by Johnson Wax would never have been realized to the extent to which it developed without the resources of ACC, even though it was a private project. It premiered at the National Collection of Fine Arts at the Smithsonian Institution and traveled to art museums throughout the U.S. and in Europe. And because it was such a large survey, it had an enormous impact and influence in the field. I know many people saw it who were not yet aware of what was going on. It was just the right timing, because it reflected all the new work that was developing, like studio glass, which began in '62. People have told me it did nurture galleries and collecting and awareness. Even Joan Mondale told me she went three times to see it. And later, when her husband became vice president, she was a great spokesperson for the crafts. So there are so many channels of connection that you can trace, and you can never document all of them. Probably what we don't know would amaze everybody. All that Mrs. Webb did on a personal level, where somebody came to her and said you know, "I don't have money to buy a new kiln, could you help me?" Or whatever. I'm sure she wrote checks for many different people, or helped them in some way. What would Mrs. Webb would have made of the field today? Well, I'm going to begin by just giving sort of a synopsis of what's going on. Creativity results in change. There are some constants: the instinct to make things by hand is as old as civilization. But you always have to evaluate it in a new context. You can't, by its very nature, keep it static. So one has to be open, as Mrs. Webb was open, to the new in terms of the 2011 era. I still respect the word craft. I think it has meaning. It has been challenged increasingly, and there's a lot of merging and blending and whatever. But I think that, for example, the DIY movement, which is so trendy now, is no different than the hobby craft or amateur activity in the '60s. It's just under a new name, and the young people who are involved with it don't know that there was something before it. They just feel very passionate about making things. It's also market-driven, and very much connected to technology and the internet. Just as there was a crafts community back in the '60s, there is this DIY community today, which is much more an Internet community, although there are local chapters and whatever. So I don't see that as anything other than a continuum. On a professional level - and I keep up, going to many different events and shows - there's a lot of exciting new work always emerging, and sometimes it doesn't get the visibility it perhaps deserves. I think it is getting the most attention in the marketplace. That's where people can buy, and where galleries show what they can sell. As I look back on the formative days of ACC, I think of the school as a patron because most people were teaching to earn a living, especially in the '60s. They could sell work for very little, at craft fairs or through their own studios. There was some market, but it was so small and the price comparison with today is amazing. A Voulkos at auction sold for more than $100,000 recently, and Chihuly commands millions for some of his works, whereas in the '60s work seldom brought more than $1,000. Wendell Castle and some others have become very successful artist/business people. What I'm saying here is that one has to be open to the fact that today is very different from the mid-20th century. But that's the nature of change. To answer your question about Mrs. Webb's impression, I think it would probably be a bit surprising to her. But I think in the spirit of her character, she would love it. She would relate to it, and would be amazed to go to SOFA or see several thousand ceramics enthusiasts attending an NCECA conference, or to observe what the vast number of craft organizations are doing today, both nationally and internationally. Knowing Mrs. Webb, she would be thinking of some way to expand what is already taking place. What would she have made of Martha Stewart and the consumer-driven popularity of craft? I think she would have every reason to be proud of her own humble beginnings in marketing, when she was selling jams and jellies, basically, up in Putnam County during the Depression. To see the market today, and the collecting and the museums, is really quite a remarkable realization of her efforts. I can only imagine that she would be, of course, surprised, but really intrigued with the vastness of activity today. And it really is vast, and complex. It has grown in so many different directions. I do think technology and the Internet is very significant. We are in a new era of opportunity, as artists today have their own websites and promotional means and Facebook connections and Twitter. The communication is a lot easier than in the '50s, when the first craft conference was held and everybody had to travel to Asilomar to meet each other. But this creates a new kind of challenge, doesn't it? To filter and distill and maintain an overriding vision? Yes, and that's why I think Mrs. Webb would have just fit in. She would probably have had a computer. She was that type of person. And she's still a touchstone. There's something so solid about what she stood for. Well, my feeling about it is that I was very privileged to join the council in '57 with such a limited amount of experience. I learned on the job and responded to everything, and I was fortunate to be in that central, right place at every time - to become director at such a young age, and to have that opportunity to be so connected with all these activities on a daily basis. So I, myself, am personally grateful for what Mrs. Webb did that made it possible for me to have such a rich life. It's all the more reason why I do have such admiration for her. Two years ago I got the Aileen Osborn Webb Award [given by ACC for outstanding contributions to the field]. I tried to summarize, in my 3-minute speech, her enormous importance and influence. I said it's very possible we would not all be here at this gathering if it hadn't been for Mrs. Webb. I think it's timely and appropriate for ACC to address more of its history, and not be shy about it. I'm all for promoting that. Because basically, people forget. That's why in every lecture, I talk about Mrs. Webb and ACC and all these things. Young people, especially, need to be reminded. 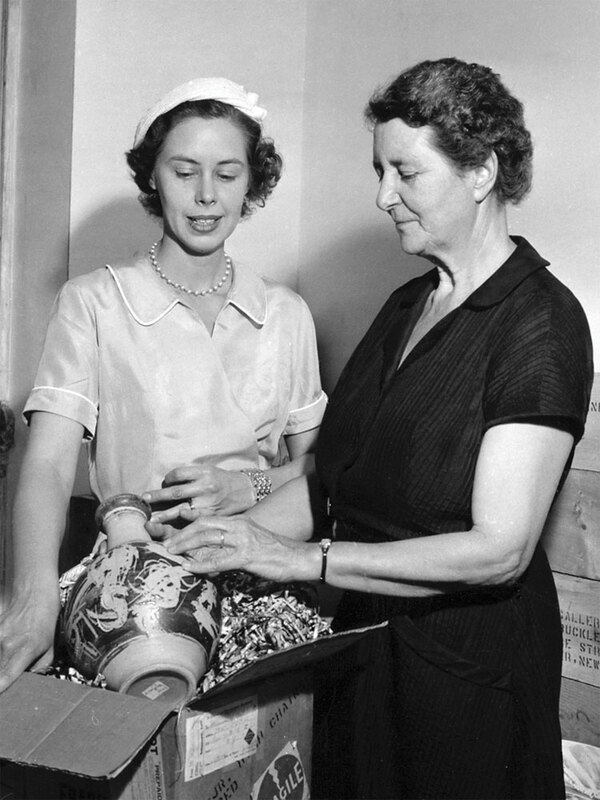 Webb unpacking objects for the 1956 "Craftsmanship in a Changing World" show, the first exhibition at the Museum of Contemporary Crafts. 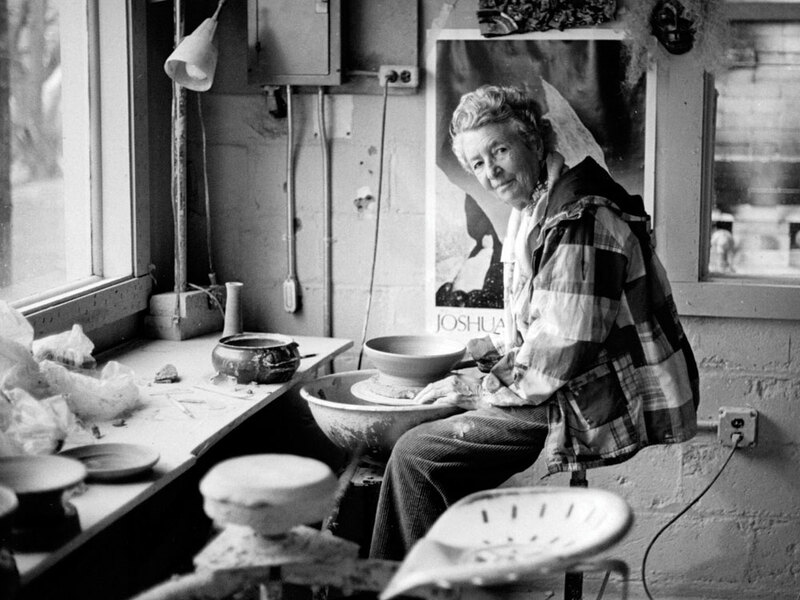 Webb unwinding at home at her potter's wheel. 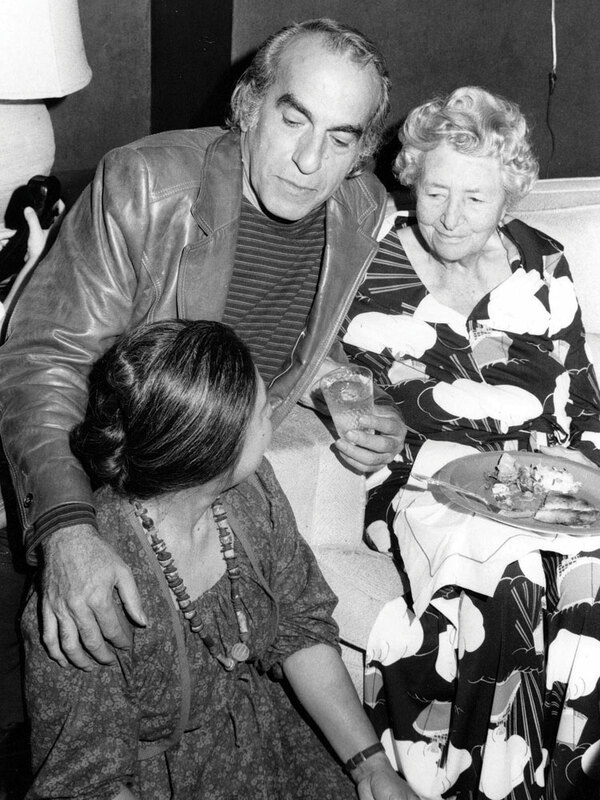 Peter Voulkos and Toshiko Takaezu dining with Webb at her New York penthouse. This year marks the 70th anniversary of American Craft magazine, a public voice of the American Craft Council, which is celebrating along with us.